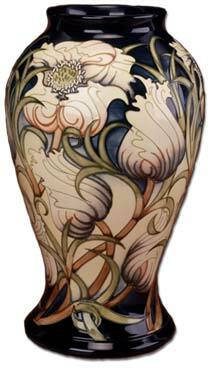 Other Moorcroft Studio artists include Philip Gibson, Rachel Bishop, Emma Bossons, Nicola Slaney and Sian Leeper. Today, the Moorcroft artists and Studio designers are young and the Moorcroft workforce has an average age of less than 27. There are degrees and master’s degrees scattered among them, but a degree is not the only true mark of success. Only at the end of a long road, when the Moorcroft designer produce’s work that is guaranteed to enrich any home with its presence, can it be said that their reputation is international and their place in the Moorcroft history books assured. These qualities are essential prerequisites to membership of the prestigious Moorcroft Design Studio, and only a few can rise to the standard set by William Moorcroft. He was born in Burslem, Staffordshire and studied art at Burslem then in London and Paris. He experimented with his own pottery designs around 1896 while working for Macintyre and produced aurelian ware, which was partly decorated with transfers and partly painted by hand. 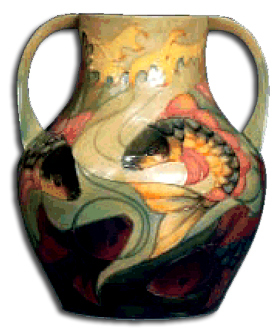 Moorcroft went on to develope lustre glazes and used oriental shapes and decorations. Some of his techniques were closely guarded trade secrets. In 1898 he was given a bronze medal in the National Competion of the Dept of Science and Art, and before long was known internationally . In 1904 William Moorcroft won his first gold medal at the St. Louis International Exhibition. In 1910 he went on to win a gold medal in Brussels and in 1913 a Diploma of Honour in Ghent. At home his work was shown alongside other well known potters in an exhibition of ‘Modern English Pottery’. Among his new ranges was Flamminian Ware, this started to show his growing interest in the use of lustre glazes. Already established was Butterfly Ware (1899). Hespian Ware, Poppy (1898) Hazeldene a landscape with trees (1902), Claremont with its toadstool motif (1903) and Tudor Rose (1904). Bara Ware made between 1908 and 1913 was produced mainly for Liberty, the famous London Dept store with whom Moorcroft had a close working relationship. Pomegranate (1910), then Spanish in the same year and Pansy (1911) along with Wisteria (1910) all showed a subtle change of direction in his style and the growing sophistication in colour and decoration. 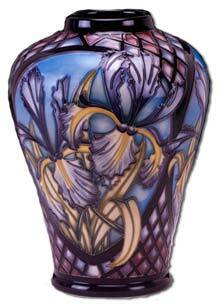 In 1913 Moorcroft set up his own Works in Sandbach Road, Burslem, from where the company continues to trade today. Landscapes like Moonlight Blue (1922) Eventide (1923) and Dawn (1926) further enhanced his reputation. In 1928 he was appointed potter to Her Majesty Queen Mary, a decorative arts connoisseur. During the Art Deco period of the 1920’s designs were changed to reflect the styles of the period and moorcroft won acclaim at the Paris Exhibition of 1925. An anomaly in Moorcroft’s designs is a series of animal and bird models designed by Francis Arthur Edwards circa 1925. The animals were glazed at the Moorcroft factory with experimental colours and marked with a Moorcroft paper label. Walter Moorcroft (1917-2002) was William Moorcroft’s son who joined his fathers’s business in 1935. Walter took over the Moorcroft pottery in 1945, the same year that his father William died after suffering a severe stroke. Walters first production, a lily bowl, was bought by the Duchess of Gloucester at the British Industries Fair in 1937. After the second world war Walter continued in the Moorcroft tradition and his designs were produced to the same high quality of decoration and colouring associated with Moorcroft, including the lily, the hibiscus and the magnolia designs. The post-war years were so successful that in 1961, Walter was able to buy back the Liberty stock, allowing the Moorcroft family to regain total control of the moorcroft pottery. Over his long tenure Walter Morcroft undertook trade missions to Canada, the USA and Japan and continued to promote the company through exhibitions. In 1963 he ended the powder blue production and in 1970 saw the last flambe firing when gas supplies changed to natural gas. Walter introduced the hugely successful coral hibiscus design in 1968 and the Bermuda Lily in 1971. In 1984, due to a major downturn and high interest rates, he sold a controlling interest to the Roper brothers, and an attempt was made to change the nature of Moorcroft pottery to mass production. Fortunately, this was unsuccessful and the brothers sold their shares in 1986 to Hugh Edwards and Richard Dennis. There was a further reshuffle in 1992 when Richard and Sally Dennis left the company. Walter retired in 1987, at the age of 70 and died in 2002. Sally Tuffin (1986-1992) wife of Richard Dennis and only the third designer at moorcroft. Walter Moorcroft retired as design director in 1987, after which Sally Dennis (Sally Tuffin) took over. Sally Tuffin, had achieved international acclaim as the ‘Tuffin’ in the leading fashion partnership of ‘Tuffin and Maule’ that rose to prominence in the swinging Sixties. Sally helped re-create the Moorcroft name and its association with quality and workmanship and Sallys inventive designs proved to be the medicine that cured the ills of the previous few years. However Sally’s stay at Moorcroft was short lived and in 1992 both Sally and Richard left the company to open their own pottery company – The Dennis Chinaworks. Rachel Bishop joined Moorcroft in 1993, as only its fourth designer in one hundred years. Rachel’s initial designs sold well and individual success was followed by the Moorcroft centenary in 1997. In that same year the Moorcroft Design Studio was formed, comprising eight designers with Rachel at their head. The Rachel story began when she was alerted to vacancies in Moorcroft for people ‘who could both paint and draw’ by her late grandmother. At Rachel’s interview there was a huge and positive reaction the moment her design portfolio was opened. Here was a designer of huge ability. However, Moorcroft was not looking for a designer but a painter, and Rachel was rejected; but, Moorcroft’s chairman, Hugh Edwards, decided to stay in touch. They corresponded for almost a year and when the old Moorcroft design team left without warning in December 1992, he contacted Rachel again. 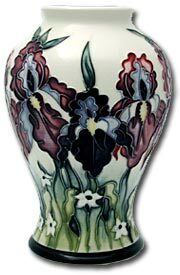 In a little over three years following the launch of her new Tigris design in 1993, Moorcroft’s sales doubled, and a new design star was born. Rachel believes “she was born to the job” – a statement that has proved to be true. Throughout her life she has been in love with the work, style and ethics of William Moorcroft, and inevitably some of her work shows clear lines of identity back to the great man. Even so, Rachel’s design style is entirely her own. Her love of the New Forest is well documented, but more recently the mountains of the Lake District have begun to exercise a strong pull. The power and majesty of God’s own creations appear to provide the inspiration for her almost continuous stream of quality design. Rachel is at home with dramatic scenery and extreme weather. Philip Gibson was born at Wolstanton, the site of one of Stoke on Trent’s once great collieries, which overlooks Burslem and the heart of the Staffordshire Potteries. In this close-knit community, his father ran his own business as a gent’s hairdresser for over fifty years, and his mother worked at Royal Doulton as a glost ware selector. Indeed, most of Philip’s family either worked in the local coal mines or the pottery industry. In his early school years, Philip Gibson showed a strong interest in art. He attended Newcastle School of Art, and then moved on to gain a BA Hon., followed in 1978 by a Masters degree in Ceramic Design at the North Staffordshire Polytechnic. After completing his education Phil went to work as a designer for Josiah Wedgwood and William Adams for nearly nine years. During his time at William Adams, Philip worked alongside the legendary Susie Cooper. When William Adams closed in 1987, Philip decided to pursue a career as a freelance designer and artist specialising in ceramics. 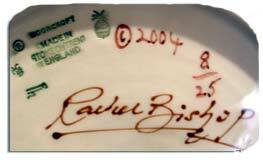 Until 1997 he worked with leading pottery companies and print manufacturers on many varied and interesting commissions. In 1997 Phil came into contact with Moorcroft’s Hugh Edwards after an introduction from his brother-in-law, Trevor Critchlow, the company’s senior modeler and mould maker. Hugh explained that he was looking to expand the availability of quality Moorcroft designs, and Phil was invited to create a design in the Moorcroft idiom. That design was later to become known as Flame of the Forest, a piece of artwork that richly deserved the accolades piled on it. Indeed, many retailers, including Liberty, have suggested Flame of the Forest is one of the best-structured designs to come from Moorcroft in the last 70 years. Later the same year, Phil began preliminary sketches for his magnificent Trout range, launched in 1999 to great acclaim. In September 1998, as Phil’s involvement with Moorcroft intensified, Hugh invited him to join the Moorcroft Design Studio as a full time member. In addition to his work as a designer, Philip has illustrated many climbing and walking guidebooks. Emma Bossons was born in Congleton, Cheshire in 1976. Her early years were spent close to her birthplace, on a dairy farm in the picturesque Cheshire countryside. As a child Emma showed a strong interest in art and as a result of her art classes, Emma developed a strong interest in watercolour painting. What she didn’t learn at school, she taught herself in her own time. Emma sold her watercolours as a sideline to her day job and encouraged by her family, she began exhibiting her artwork in exhibitions around the country, including the British Society of Painters Exhibition in Yorkshire. She was subsequently made a Friend of the Society. Emma eventually progressed from watercolours to painting ceramics at Masons Ironstone in Hanley, Stoke-on-Trent. On a visit to the Moorcroft factory shop. she was bowled over by what she saw when she first stepped into Moorcroft. She had gone there to help her mum choose a gift, and she left with a perfect present and the overwhelming desire to work at the factory one day. Emma arrived at Moorcroft in 1996, a time when Hugh Edwards was looking to expand the availability of quality Moorcroft designs. After the success of her first Open Weekend staff design, Emma was invited to create a design in the Moorcroft idiom. That design was later known as Victoriana. and richly deserved the accolades piled on it. Victoriana was the Collectors’ Club piece for 1998. It was a qualified success with members of the Club. Since then, Emma has become a leading member of the Moorcroft Design Studio and is credited with a number of collectors’ pieces, including the beautiful Queen’s Choice range. Nicola graduated from Staffordshire University in the summer of 1997, where she specialised in surface pattern design. Nicola started her career with Moorcroft in November 1997. She was soon represented in the 1998 catalogue with her Amazon Twilight vase. 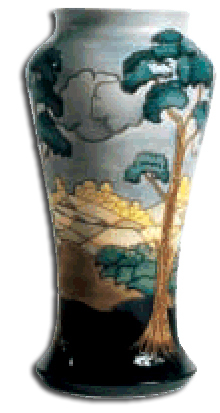 The vase was the run-away success of 1998. Hawthorn was her next piece and was adopted by Liberty’s of London as an exclusive limited edition. After showing her portfolio to Hugh Edwards, she says, she did a couple of designs, then looked carefully at Moorcroft pots “and it just clicked.” Although not tied to one palette, she generally favours earthy, natural colours, perfect for that twilight effect. In May 1998, together with designer Emma Bossons, Nicola responded to a call to visit some of the exquisite tropical islands scattered across the South Pacific. Their mission was to encapsulate the Millennium in designs, which drew inspiration from time. From that simple theory, the idea of the Dateline Series was born. On the island of Tahiti, made famous as the first home of Fletcher Christian and the Bounty mutineers, Nicola took the elegant Perfume Tree for her inspiration. Drawn with a delicate colour palette, the Perfume Tree became Tahiti. Moorcroft’s Millennium plate was the most superb year plate to date. With the arrival of a new Millennium, came Nicola’s design ranges entitled, Anna, Fruit Garden and The Ashwood Hellebore together with her magnificent limited edition vase Jerusalem. Said by the many hardened and knowledgeable ceramists to be one of the finest vases to have emerged from Stoke on Trent in decades. The vase was massive by any definition. The shape was created to fit the design, and as a result the proportions are perfect. Line drawing alone took 16 weeks, while colour combinations were only finalised after a further 8 weeks of trials. Sian was born in Padbury, Buckinghamshire in 1970, the second of four sisters. During her early school days, Sian showed a strong interest in art and design, and after secondary school, she went on to attend Yeovil College, where she studied an Art Foundation course for two years. She then moved on to the University of Brighton and studied for a degree in 3-D Design, specialising in silversmithing and ceramics. She graduated with BA (Hons) in 1988. Sian was torn between pursuing a career in jewelry or ceramic design. As occasionally happens, fate intervened and gave her a gentle nudge in the right direction. She read a Moorcroft advertisement calling for talented artists who could both paint and draw. Sian stayed for more than a year at Moorcroft, learning the intricate art of tubelining and painting. However, the pull of her childhood roots became too strong, and at the end of the year she left and returned home to Somerset. After a cramped interlude with a small Somerset ceramic company, Sian became a freelance designer, and was soon decorating her own ceramics and selling them in local galleries. Her local success saw some of her designs filter into a wider circle of galleries throughout the United Kingdom. Eventually they crossed The Pond to the United States. Over the next three years Sian spent time travelling back and forth to the States, gathering material and inspiration for design ideas. With the new millennium approaching, Sian decided that she had spent enough time ‘going it alone’ and decided to contact Moorcroft, to see if she could take up where she had left off. After a lengthy meeting with Hugh Edwards, she took her seat in the Moorcroft decorating room. Only a few months later, her Moorcroft decorating techniques returned, at which point she was appointed to the coveted Design Studio and became a full-time designer. Sian’s first catalogue design, the limited edition Pride of Lions, appeared in 2000. In the same year, Sian was also represented in Moorcroft Enamels’ catalogue with her wintry Polar Bear Collection and tropical Jungle Collection. Throughout 2001 Sian worked on a number of design themes. The arrival of the limited edition Tamarin came as no surprise, but her Cleopatra range was altogether different. Cleopatra was a departure from Sian’s customary style in that it was a structured design featuring a stylised Trillium flower. The Cleopatra range encompassed no less than nine shapes, and its popularity ensured its continuation into the 2002 catalogue. Champerico, the Guatemalan slipper orchid, and Tembusu,and the Malaysian flowering tree, are illustrations of Sian’s developing passion for exotic flora, whilst South Pacific is the result of an opportunity to use a palette of vibrant, strong marine colours. Ranthambhore is both the name of a Moorcroft limited edition vase and a national park and tiger conservation area in Rajastan in India. The park is littered with the ruins of an 11th century fort, which is depicted on the vase.